Cornbread is widely acknowledged as the first writer to take his name out of his own neighborhood and seek citywide recognition for his tag back in 1967 before the phenomenon began in New York City. While gaining citywide recognition for his name, he performed a number of high profile pranks (reminiscent of modern day Banksy) such as tagging an elephant in the Philadelphia Zoo, staging a fake shootout in order to spray paint a score of police cars as well as hitting the Jackson 5’s private jet while parked at the Philidelphia International Airport in front of a sea of fans. This latter stunt earned him a visit from American International Pictures where he and his buddies became the uncredited basis of the film Cornbread, Earl and Me (1975). 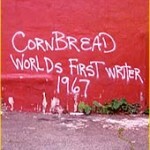 Cornbread has battled drugs and has been in and out of jail since the eighties, but is making a come back. He recently granted us a rare interview including a tour of his old ‘hood and the location where he sprayed his first tag. Would you be interested in a sticker/art trade? Interested… What do you propose?